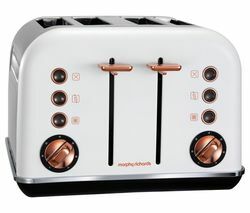 Morphy Richards toasters come in an array of colours, designs and functions to suit every kind of kitchen. With everything from simple Morphy Richards toasters to fancy machines, you’re spoilt for choice with our great range. For a simple toaster, the Chroma range makes a great buy. For under £30 you get a warming function to keep your toast warm as you finish making the coffee, a defrost function to thaw out frozen bread, and a high-lift eject for easily removing your toast when it’s done. Coming with a two year guarantee as standard and available in a range of colours, it’s a great two slice machine. For families and serious toast-lovers, the Accents Morphy Richards toaster range also comes in a variety of colours and has four toasting slots, as well as your regular defrosting and warming settings. Our range of Breville toasters offer up a nice alternative, with prices starting at under £20 for a two slicer, or under £40 for a four. If you’re looking to really invest in a super toaster then check out our selection of Kitchenaid toasters. 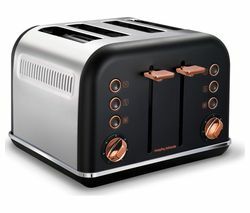 The retro inspired Artisan 4-Slice Toaster would look perfect in a 50’s style kitchen, and comes with a bagel function too. Whether you’re looking for a kitchen masterpiece or a simple bit of kit, our range of toasters has something for everyone.